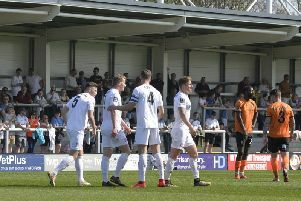 Midfielder Richie Baker is poised to return the AFC Fylde squad for their intriguing Lancashire derby clash away to Chorley tonight in National League North. Baker sat out the 2-1 win at Telford on Saturday as a precaution as he rested a calf injury. Coasters’ manager Dave Challinor said: “Hopefully, Richie will be okay. Meantime, the Coasters’ boss has given Matt Urwin the go-ahead to continue in goal against the Magpies this evening after picking him ahead of Ben Hinchliffe. Challinor said: “Matt got the chance on Saturday and has grasped the opportunity. “Ben has been fine about losing his place - he knows that is part and parcel in football. Challinor is preparing for all eventualities tonight as Fylde prepare for a fixture originally scheduled for Boxing Day, only for the match to be postponed because of waterlogging. The AFC Fylde manager is expecting Chorley to show a direct approach this evening. He said: “Their pitch is not in the best of condition and it may not be the ideal night to get the ball down and play, so we will have to adjust the way we play according to the conditions. The two sides met as recently as January 1 at Kellamergh Park where the Coasters won 1-0, with a goal by Danny Rowe. The Coasters have built up a formidable reputation on their travels this season - they have own nine out of 12 matches on the road. Challinor said that the club had a couple of inquiries for Josh Wilson, who was transfer-listed by Fylde last week after being taken off as substitute in the home defeat at the hands of Worcester City. Lloyd, who was named the Coasters’ player of the month said: “It’s always great to score and I knew that my 50th goal was coming after scoring a couple at Eastbourne in the FA Trophy. “It was nice to get it out of the way, so it wasn’t playing on my mind too much. I still need a few more to get 20 for the season and that’s what I’m hoping to achieve next. “Dion (Charles) did well for the goal. He drove inside and slipped me in. I thought I had taken it too wide but thankfully I managed to angle the shot right across goal and it’s kissed in off the post. “I had been getting a bit of stick from the home fans, so they should be able to take it back with goal celebrations. “The win has set us up well for Chorley next. We got one over them at our place a month ago and hopefully we can go there and do the same thing. “ We know it will be difficult on a similar pitch to Telford’s – a bit bobbly – but we just have to go and do another professional job. Despite strong competition from fellow forward Danny Rowe, who scored eight last month, Lloyd was pleasantly surprised to win the club’s monthly award. “There are still aspects to my game that need work but that’s the case with most players,” he said.